At the Frankfurt Fair 2014 we presented our visitors with a Lakewood M-38 custom model. At first glance this guitar appeared to be quite ‘normal’ – well it is a Custom Shop model – even if the woods making up the headstock, fret board and bridge are somewhat eye-catching. Looking more deeply, the more attentive observer will have noticed that both blocks are made of spruce. Eventually it becomes apparent that this guitar is the result of a fundamental review. Over the past few years we have learned, in discussion with our customers, that there is an open mind in regard to alternative materials. 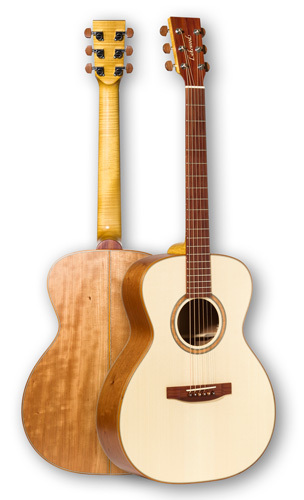 Ever more frequently the question arose whether guitars could be built from local materials. In the Lakewood Custom Shop (for our bespoke guitars) we have offered this flexibility for numerous guitar parts over many years; for example, it has been possible to order back and sides in maple, cherry or walnut, etc. This can also be done with bindings, necks and head stocks, etc. To date, however, there were some guitar parts for which we were unable to offer European options. Fret boards are usually made of either rosewood or ebony and the same applies to bridge plates. Also, the Lakewood neck and tailpiece blocks were always offered in mahogany. With immediate effect, it will now be possible to build guitars with parts made completely from local woods. For fret boards, headstocks, heel caps and bridge plates we now offer plum wood. This is a very attractive, hardy wood which is eminently suitable for these guitar parts. We are also able to offer bridge pins, strap and tuner buttons in plum. With a guitar made completely from local woods, also the internal parts are affected by the concept. So the tail block is made from spruce and the neck block from laminated spruce. Finally, the joint between neck and body is strengthened by means of beech dowels, which together with the usual neck bolts, ensures a perfect bond between these parts. In the creative process of compiling a guitar on the 3D-Guitar Designer, clicking on ‘Use only Local Woods and Materials’ in the menu will ensure that only local woods are offered. If this box is selected, only those options are shown (local woods mode) and the internal elements are shown in spruce. Furthermore, all mother-of-pearl parts are excluded and the Lakewood logo is executed in maple. Of course, the new plum wood option can be selected in the normal mode of the 3D-Guitar Designer and freely incorporated into any design of your choice. You can select the the 3D-Guitar Designer here. Only European woods are shown in the options menu, if the appropriate checkbox is checked.